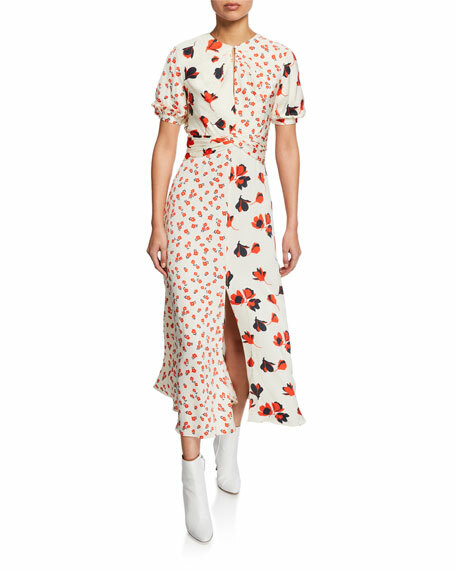 Self-Portrait mixed floral print dress with front slit. Jewel neckline; button/keyhole front and back. Equipment "Roseabelle" dress in abstract floral-print. Band collar; concealed button front. Long sleeves; wide, button cuffs. Self-tie sash at waist. 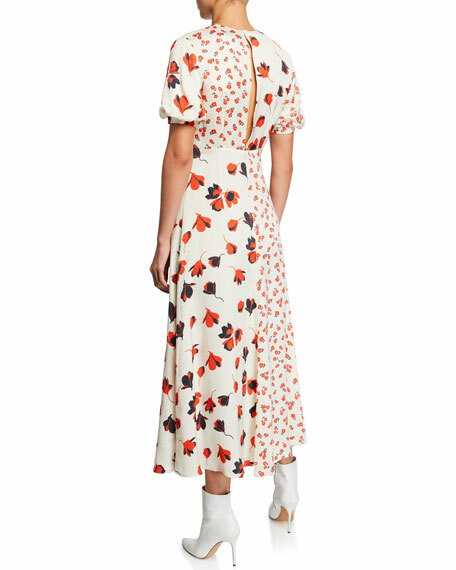 Equipment "Roseabelle" dress in abstract floral-print. Band collar; concealed button front. Long sleeves; wide, button cuffs. Self-tie sash at waist. A-line silhouette. Knee length. Side slits. Even hem. Silk/viscose. Dry clean. Imported. Model's measurements: Height 5'10"/177cm, bust 33"/84cm, waist 25.6"/65.2cm, hips 35.8"/91cm, dress size US 2-4/FR 34-36. Etro dress in engineered floral-print silk with lace trim. V neckline. Long sleeves; tied bell cuffs. Slightly cinches waist. A-line silhouette. Midi length. Silk. Made in Italy. Model's measurements: Height 5'10"/177cm, bust 33"/84cm, waist 25.6"/65.2cm, hips 35.8"/91cm, dress size US 2-4/FR 34-36. EXCLUSIVELY AT NEIMAN MARCUS Jovani scuba dress with balloon sleeves. High-bateau neckline. Long balloon sleeves. Shirred waist at right. Body-conscious silhouette. Back princess seams. Hidden back zip. Knee-length hem. Polyester self/lining. Dry clean. Imported. Model's measurements: Height 5'10.5"/179cm, bust 32"/82cm, waist 23.5"/60cm, hips 34.5"/88cm, dress size US 2. Lovers And Friends "Ellie" dress in cheetah-print with draped ruffle trim. Square neckline. Spaghetti straps. Sheath silhouette. Midi length. Back zip. Vented hem. Viscose. Imported. Model's measurements: Height 5'10"/177cm, bust 33"/84cm, waist 25.6"/65.2cm, hips 35.8"/91cm, dress size US 2-4/FR 34-36.